‘Family vacation.’ The words conjure up images of lazy days at the lakeshore, campfires with roasted marshmallows, sleepy kids sharing rooms. Often those sweet pictures in our head don’t quite match up with the reality of a family vacation. Vacations can be stressful, taking us out of well-developed routines and throwing us at the mercy of compromise. Our kids may spend the trip bickering and scowling, or overtired and cranky. Those well-placed gas stations you imagined might be too little (and sometimes show up too late). Delicate family situations or re-surfacing disagreements can put a damper on the fun. During those stressful times, prayer for your family vacation is needed the most. Please bless this time of family vacation. Help my family to get along, to enjoy one another. Maybe toss a couple of those idyllic imagined scenes into our path? May we be able to see the wonder You instill within the chaos of our days – whether we vacation near or far away from home. On this everyday, normal day that’s somehow still outside of our routine, help me to embrace my family, this time of vacation, and the ordinary yet extraordinary gifts You’ve given. Open my eyes to see that vacation will end but the memories of it will remain and give me the strength to make them sweet. Pour some of that strength into my very being and bring me through to the end of vacation with a thankful heart and unceasing praise. Are you looking for more inspiration this summer? Fill up this “Fear Not” Insulated Tumbler with ice cold water, grab this Jesus Calling Creative Coloring & Hand Lettering book and focus on His beauty as you watch the waves roll from your blanket on the beach. 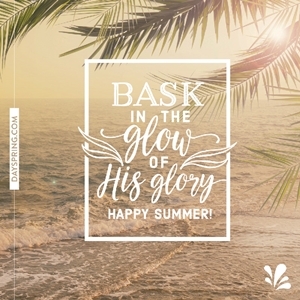 Also, be sure to send your loved ones a Summertime Ecard to remind them to praise God for the beautiful, sunny summer months. Dear Lord, help me to embrace my family during this time of vacation.